Ooh, well done. And can I just say one more time how much I love your new haircut? I layer leggings together quite often too hehe! Stays nice and cozy but comfortable too! I would never have thought to layer leggings under tights. Very tricky! You look amazing here. wow seriously that looks amazing for all those layers! i was just squinting to see if i could tell! nice work! This is such an unexpected combination, but it works so well. I love the idea of hidden layers! Wow good for you. Once again, I love your color palette. And I can't believe those shoes are from payless. They are awesome! so cute! and warm! at least it's a little warmer today in the area!!! Love the tights very much. And you coulda fooled me! Doesn't look layered at all. i love that necklace. you always wear it really well! I love wearing sweaters under sleeveless dresses- it's a great way to make them wearable for winter without covering them up! you look fantastic, by the way. I ALWAYS layer my tights in the winter! I invested in a couple pairs of super warm wool tights and I just wear them as a "base layer". I also like thigh high socks--they're the best! haha you look so cute! I cant even tell you are wearing a sweater underneath....those shoes rock by the way. Love the outfit! I wish the Targets near me had awesome green tights. They only seem to have black and grey around here. looove that necklace and those shoes! You can't even tell. I've done my fair share of layering in the past too. I always felt the darker the tights the easier it was to layer. love the tights with your outfit, so festive! 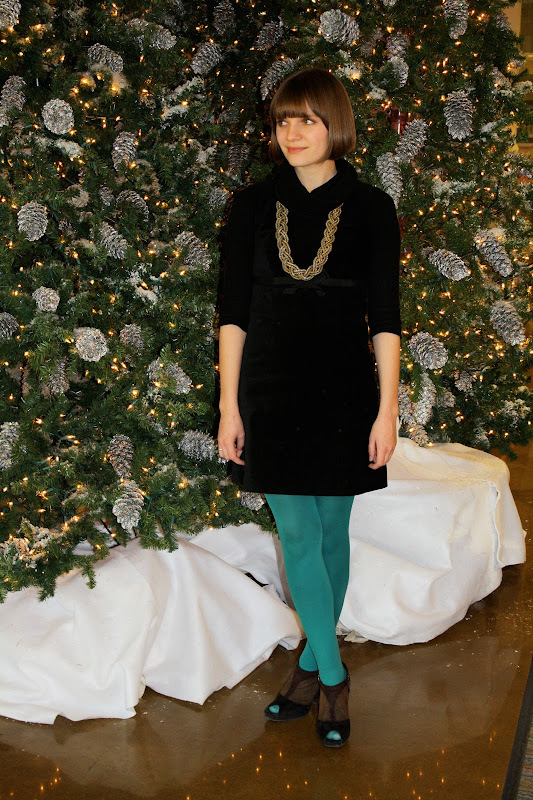 i like how the dress blends seamlessly with the sweater - sometimes that's hard to pull off with shades of black! this outfit is wonderful, I love the bright colored tights! I love your tights and necklace! I love your hair in this shot and I really love your festiveness...is that a word? p.s. Did the necklace find you? Such a fan of those shoes! the more you wear that necklace, the more i want it! I LOVE this, the simple black with the pops of gold and teal- so simple but amazing. Brilliant! I would have never thought to do the tights thing but it's such a great idea and no one would be any the wiser! S.